I discovered @BarbyLocs through her bold and unapologetic images that depict the beauty of the black women’s physique. 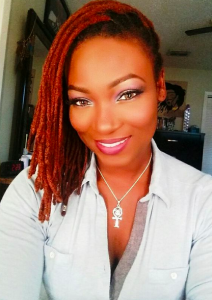 I’m excited to share a glimpse into her journey as a Wife, Mom, Fitness Coach, and Model — with fiery locs! My name is Shayla DeFils I also go by BarbyLocs. I am 34 years old free spirit. I am also a 8 year military veteran, a certified personal trainer, and actress/model. I am from New Iberia, LA but reside in Bossier City, LA. I have 3 boys and an amazing husband. I always knew that I wanted to help people, especially women thats why became a Personal Trainer. I help women be healthy and feel better about their bodies. 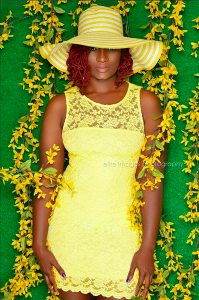 I am very driven about my passions and goal so I have always worked hard to grow in my crafts and as a person. I hope that one day all this hard work pays off for my family. 2. 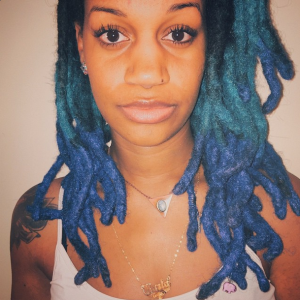 How long have you had locs and what method did you use to start your loc journey? I have had my locs for 4 years and 5 months now. They were started with the comb coil method. 3. Who or what is your hair idol or hairstyle inspiration? 4. What lessons have you learned during your loc journey? I have learned patience in all it’s glory! I thought i knew what that was and had it down packed. I was totally wrong. I takes the up-most patience to go through a loc journey. I think that i have it mastered now. My locs have their own mind, I pretty much just let them be now. 5. What are your favorite products to use on your locs? I am obsessed with using coconut oil and water on my locs! That is guarantee loc food. it refreshes my locs and keeps them healthy. I also love using eco gel retwisting. The hold is so beautiful. I try to keep everything simple to avoid junk and build up. 6. 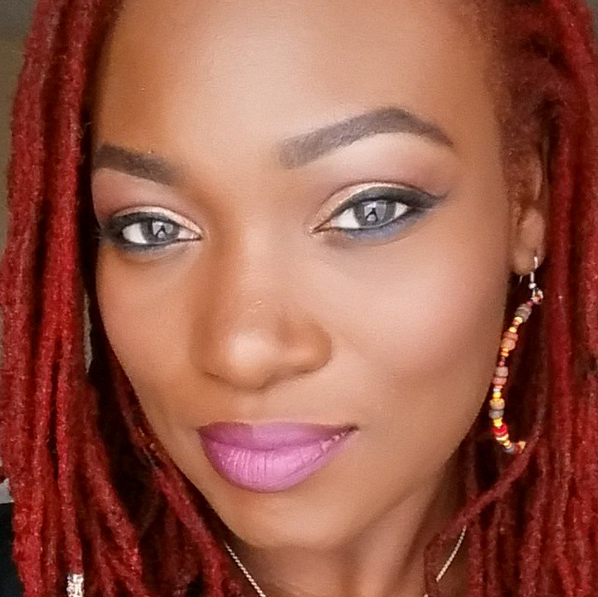 What advice would you give to someone just beginning or considering locs? I say go for it!!! Don’t let negative outsiders influence you. The feeling of freedom locs give you is euphoric. I wish everyone could experience journey of locs. 7. How often do you maintain your roots? I started my locs with a loctician. She kept them up for 3 months, I have been caring for them myself ever since. Now since they are longer, some retwists I go to a loctician. I care for them with coconut oil and water spritzer and retwist with eco gel, the one with olive oil in it. I spend 10 minutes under a dryer and then air dry the rest. I retwist once a month. 8. How many locs do you have? 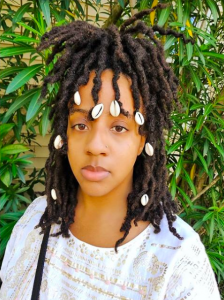 I have always heard that it is bad luck to count your locs, and still to this day I have nightmares about them coming out in some way, shape, or form. lol. 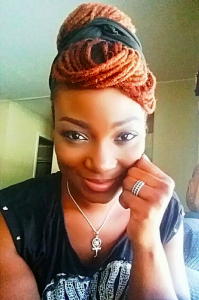 I have combined all of my front locs around my hairline because I felt they were too small or thinning. I may have just been paranoid. 9. Why did you choose locs? I wish I was born with locs! I never understood why I had to put a perm in my hair every month. I always wondered why it was so hard for my hair to grow. I felt like I was being brainwashed into wearing wigs, weave, and putting perms. I always wanted locs. I let people talked me out of getting them for years. I can tell you that since having them I have also experienced a spiritual journey. 10. 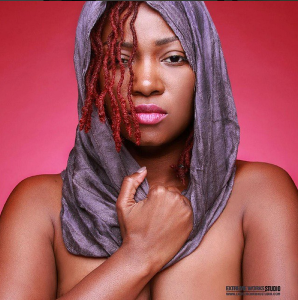 How has having locs affected your modeling endeavors? They have helped me with my sensuality. I feel like a woman, the longer they get, the sexier and powerful i feel. I am more confident and it shows through my work. It’s like we are two different elements but we are one. my locs command attention. 12. Anything else you’d like to share? I will never cut my locs. I don’t understand locers who do. My locs are staying until I die! Hopefully even then they keep growning. I loved the interview you did with Barby. You asked pertinent questions that drew in the reader. Barby’s answers were warm and interesting. Thank you so much for checking out the feature! 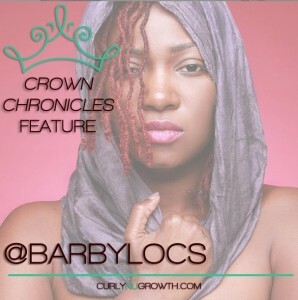 BarbyLocs is amazing, make sure to follow her on Instagram! Very good interview. I love barbylocs! I am very proud to say that Shayla DeFils/barbylocs is my daughter-in-law/daughter. This interview was really nice. Almost make me wanna start locking. She and my son wanted me to do that but I’m not ready yet. I have to say that Shay wears her locks very well and I’ve never seen them any other way but TOGETHER! Very good information. Thanks for sharing your journey with us. It gives a different insight on the loc journey. Barby is a force to be reckoned with. I loved this interview and I know that she will continue to flourish and grow. Thank you for checking out her interview and I definitely agree with you — She’s one of a kind! Nice interview. She is stunning! 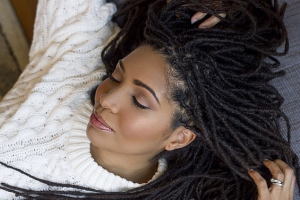 I enjoyed reading about how much she loves her locs. Great article on a lovely, loc’d sister! Also nice to discover a new loc rocker to follow on YouTube!